An Interview with Robert Darnton. · One Book. One Author. One Hour. 1:23 Darnton is uncertain as to how his book came to be on Booknotes, but he jumped at the opportunity to be on the program. 2:05 Darnton had been interviewed before, but he had never been to a studio quite like C-SPAN. This is because the studio had lots of energy, enthusiasm, youth, and also seriousness. A part of this seriousness had to do with how much Brian Lamb had prepared for the interview by doing a deep-read of the book. 3:29 Darnton has been interviewed several times and it is very clear that some have not read the book at all. But others clearly do read the book as thoughtfully as Lamb, especially at shows abroad. Through his preparation Lamb created a program that contributed to American literary discourse. 6:56 The success of an hour long program which features a conversation with an author about their book hinges on the audience, which would be a small self-selected group. Most general programs on American TV are superficial, while this program allowed a back and forth conversation which could go in unexpected directions. 9:26 Thinks that studying programs like this, which represents the conversation that surrounds books, will continue to be an important part of the history of the book. This is because you need to understand how the work relates to the time and place in which it was printed and the book’s reception. 12:18 Darnton has doubts about how much the general public finds information about methodology interesting or useful. However, he believes that Lamb was able to frame these questions in a way that made them more interesting and engaging as a skilled interviewer. This investigation of process does allow non-specialists to see how history is constantly reinterpreted and is not static. 18:20 Biographical questions being a part of an interview or not has to do with the format and length of the program and is not something which Darnton sees as unique to Lamb or Booknotes. 20:10 Prior to his appearance on the show Darnton did not watch the program because he does not own a television. 21:49 The advantage of this Booknotes collection is having a record of cultural history that was popular during the time period. The resource is of great value for future historians. 22:45 Darnton would have certainly returned if asked back for a second interview. In his own case the book which was discussed, George Washington’s False Teeth, was his least significant book so there is some disappointment about appearing on the show with this work. However, because Lamb asked questions about process of writing and the author’s biography, the audience could still get a feel for what the author was about even if the work itself wasn’t their best. 26:51 It was around the time of his appearance on Booknotes that Darnton began to shift his focus towards writing for the “general educated public.” His appearance on the program confirmed that this was what he wanted his focus to be and that there was indeed an audience for this kind of work. 27:53 Following his appearance on the program he has written several books and became a teacher and librarian at Harvard University. 30:38 Darnton believes that Booknotes raised the level of public discourse and that more serious programs are needed which are aimed at the general public. He thinks that online mediums will be able to open up this kind of conversation through open access to the cultural riches of libraries, museums, and archives. 34:30 Darnton feels that in this open access, digital future that librarians will be more important than ever because the vast scope of the internet leaves people lost. So librarians will provide guidance to reliable sources and background information. Misha Griffith (Oral Historian), “An Interview with Robert Darnton.,” One Book. One Author. One Hour., accessed April 24, 2019, http://booknotes.gmu.edu/items/show/2795. 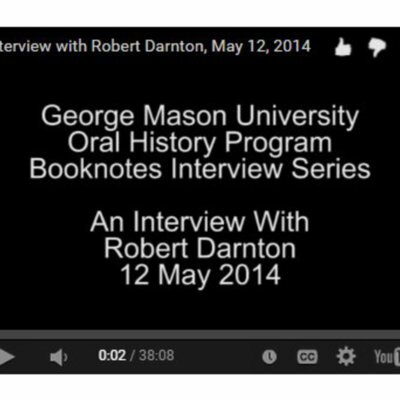 Author Robert Darnton is interviewed as part of the Booknotes Oral History Project on 12 May 2014. Mr. Darnton discusses his appearance on C-SPAN's Booknotes program on 21 August 2003, where he discussed his book "George Washington’s False Teeth: An Unconventional Guide to the Eighteenth Century". Booknotes Collection. R0143, Box 01, File 03.